I pray you had a wonderful Christmas break! 2012 is right around the corner and anticipation is high regarding all the possibilities that lie ahead for each of us. Now is the time that many who participate are writing out their New Year's Resolutions. We like resolutions because we want to be challenged, we want to grow, we want to find ourselves at the end of 2012 better and wiser people. So here is one somewhat simple yet life changing challenge you can take along with myself and many others- Reading God's Word in it's entirety this next year. 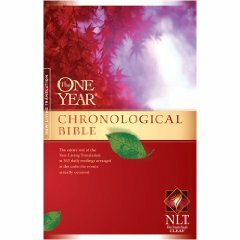 The One Year Chronological Bible is our book of choice and I love that it is written in an easy to understand translation (New Living Translation) and it breaks down the daily reading to about 15 minutes a day. Now that's doable! So if you do not have one you can click here to order it or you can download one onto your smart phone or tablet here. I pray you all have a prosperous, God filled, and Happy New Year!! And thank you for reading this blog this past year. Your support and comments have blessed me more than you know. What do you do when you plan, strategize, pray, and believe for things to happen... and they don't? Well, when this year began 363 days ago I was certain there were a few things I would see major changes in during 2011. Some of those things were personal to me, and some of them were dealing with where we live, and some were dealing with our church. It's a good thing I am not a betting person because none of them, I repeat, none of them came to fruition over this past year. So, what do you do when you have done all you can and nothing seems to be working the way you had hoped? #1 Remember- Things could be worse. I know it is such a cliché but it is so true. I am alive to have another year to work on my personal goals. I have a home that I love and a car to drive to Alachua everyday. Our church is filled with the most giving, caring, and loving people who weekly take our temporary home (a school cafeteria) and turn it into an amazing sanctuary where countless lives, marriages, and homes have been changed. Your past is in the past and nothing can change it. But you can change or redirect your focus to what is ahead. #3 Reflect- Ok, this is the one time I am going to say it's ok to look back. So, go ahead, look at the past and examine it by questioning whether or not some of the reasons your plans didn't morph into reality were due to anything you could have done differently. If so, make the changes needed to change the outcome of your situation. But what if you have already done all you can do and still nothing changed? How many times in life have we let everyone know we no longer wanted to participate in something by saying, I'm gonna sit this one out.? Sitting is so much easier than standing, fighting, playing, working, or believing. But simply put, you will never win in life by sitting. So, if at the close of 2011 you find yourself like me with goals not yet achieved, moves not yet made, or buildings not yet built, keep standing because our God is a god of timing not time. and no matter how tempting it is to sit, keep standing. To this day I can walk in a room teeming with people, conversations, and laughter, and piercing though all the noise a clearing of the throat can be heard, probably only by me, and in that moment I know my dad is here. After 18 years of living with and being raised by my parents I have learned my father's voice and can still know when he is near, even when I can't see him. This last week of Christmas we will be surrounded by the sounds of laughter, conversations, music, cash registers, and unwrapping of gifts. Still in all the noise our Father is near. Over 2000 years ago we were so far from God that he sent His Son to us, to walk with us, to teach and train us, to redeem us, so we could be... near. Although we have known for months that Christmas was coming, and we have made our lists and checked them more than twice, still over 40% of us have not completed our holiday shopping. So with the final countdown underway I thought I’d share a few tips that may help you ease the stress this week when it comes to finding those perfect last minute gifts. Most of us are baking cookies, specialty breads, and holiday candy this week. Buy a cute little goody box or tin (Wal-Mart has them for a great price) and give the gift you know they will enjoy. Homemade granola is some of my favorite things to give. Place granola in a little clear glass container and add a red ribbon. You’re done! The recipe found here is pretty close to the one I make. Here's one a dear friend gave me last year. It was so cute and quite delish!! Make gift certificates for baby-sitting your friend's kids or for detailing your spouse’s car. If you have a specialty like cooking fabulous meals or cutting hair, those are also great things to offer on a gift certificate. Get creative and think outside the box. If you do your gift will definitely be one of a kind and VERY much appreciated!! There are two schools of thought here for me. One is that if you just received a new gift you know you will never use, then by all means pass it along. If, and only if, you feel the person receiving the gift will appreciate and use it. The second school of thought for me is this, I personally LOVE to receive 'pre-owned' gifts that have meant something to the person passing it along to me. Some of my most prized possessions were handed down to me from family members and I can’t think of anything I would rather have to remember my loved ones by. So if you give something of sentimental value to you, make sure you let the recipient know where you got it from, how long you owned it and why you have loved it so much. They will forever cherish it!! I love that you can now purchase gift cards to anywhere in your very own grocery store. No more running to 10 different places!! Usually near the checkout is where you'll find a rack full of the most popular retail shops, online stores such as iTunes & Amazon, and restaurants. So as you finish up your grocery shopping this week pick up that last minute gift for your uncle, you know, the one who already has everything. And remember, the most important things in life are not things. Enjoy the last week of our 2011 Christmas Season! !